But Which Word Lists To Start With? If you're serious about winning, it's time to hit the word lists. Top word game players commit hundreds, if not thousands, of obscure words, names and facts to memory by organizing them into digestible lists and revising them regularly. So I've put together a bunch of the most important lists right here for you to start memorizing. 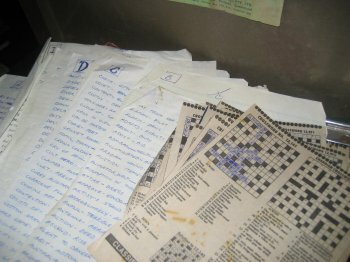 One year, while I was still in primary school, I spent the entire summer holidays creating a dictionary to help me beat a friend at school in solving the daily newspaper crossword puzzle. When my partner and I were moving house recently, I came across the first draft of my home made crossword dictionary in an old trunk in our store room. If I ever get around to it, I'll track it down again and show you. I read William Golding's Rights of Passage twice. First to create a Nautical Glossary, and then to see what the story was about. My serious efforts to understand the principles of Islam, culminated in a list of Islamic Terms Allowed In Scrabble. As a technical writer, I once managed to sneak a list of unusual plurals, called More than one Platypus, into a computer manual. Over the years, some of my lists of words have disappeared in bookmarks, buried hundreds of pages deep in tomes I no longer even remember owning. Many more were lost forever as long-neglected storage boxes disintegrated in damp basements. These pages will not only put an end to this wastefulness, but will make the fruits of my labors available to fellow word-buffs out there. Whether they help you solve crossword puzzles, win Scrabble games, improve your vocabulary, or whether you just can't resist a new list of cool words, I hope there will be something here for you. This will save you hours and hours of hard work, that you can use to ... er ... make other lists. There are nearly one quarter of a million words allowed in Scrabble, so you're not very likely to learn them all in a single sitting. I recommend that you start with the ones that will get you winning more games immediately! If you're a beginning Scrabble player, below is a small set of Scrabble word lists you should get your teeth into immediately. If you're a bit more advanced, or just very keen to win, you'll find a tonne of great lists and tips about Scrabble words in Trevor Johnson's very helpful eBook, Scrabble Bonus Word Techniques. That's it there on the left. Crossword makers tend to assume we have a pretty impressive general knowledge. But if you're anything like me, you don't instinctively know who the 28th president of the United States was, you've never heard of the capital of Uzbekistan, and you certainly don't know the second last letter of the Greek alphabet. We have to get this knowledge by taking the time to memorize the answers that crossword compilers assume we will have at our fingertips. These words then become the bread-and-butter of crossword play, by enabling us to fill in the answers to 'factual' clues, revealing vital letters that serve as starting points for clues that are more cryptic and difficult. Word search puzzles usually follow a theme. Word search themes are often based around things like holidays, history, literature, and other aspects of culture. Find existing word lists — Hey, why go through all the major dictionaries looking for types of birds when somebody else has already spent an entire year doing it? 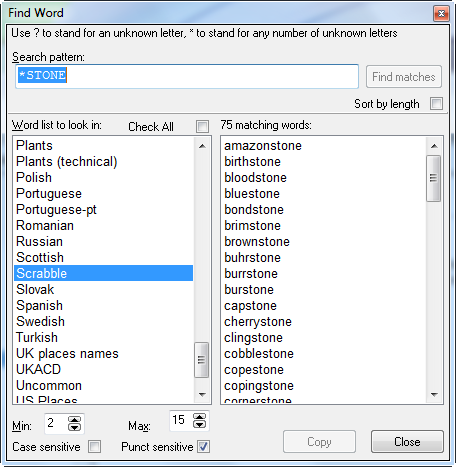 Create new word lists — Using a neat wordsearch feature I can target any or all of my dictionaries and lists to pull out all the words having a specified pattern (e.g. all the words ending in -STONE). Manage my word lists — By storing all my lists in a database, rather than in a text document, I can easily search and update them, editing existing entries or adding new words as I come across them. 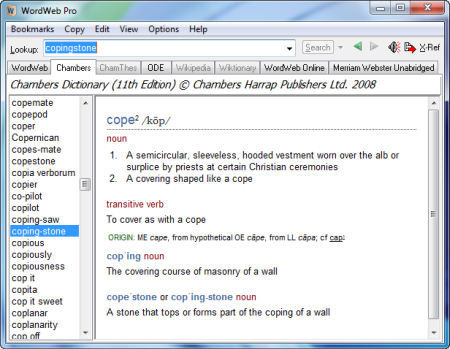 Of course, if you like any of the word lists you find on this page, or anywhere else here at Word-Buff, please feel free to copy them into a text file and import them into your word list manager in a few seconds! Oh... I should probably tell you what it's called - WordWeb Pro. And BTW, if you're not sure where to even begin when faced with memorizing a long list of obscure words or facts (like the letters in the Hebrew Alphabet or the Nobel Peace Prize winners or whatever), here is the best way to memorize lists that I know of.